Punggol Point located in Punggol New Town is an upcoming development for those who stay in the Northeastern part of Singapore. From Upper Serangoon Road starting in Potong Pasir to Punggol Road’s dead end that’s where Punggol Point is. This Punggol Jetty area used to be populated with many seafood restaurants back in the 1980s-1990s. It underwent extensive redevelopment as reopened as Punggol Point Park in Nov 2011. 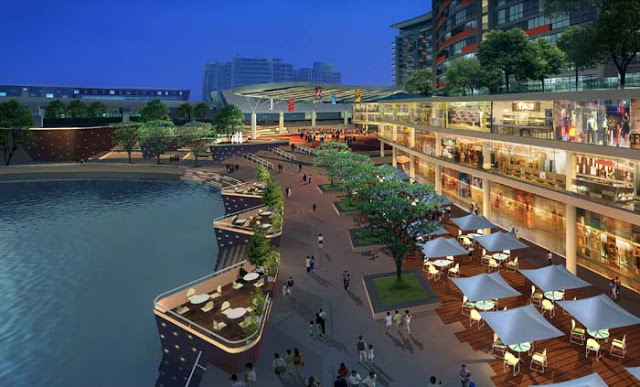 It is envisioned to be the next East Coast Park alike food and beverage hub by the sea. Northeast line and the Punggol Bus Interchange. The new Punggol Point Road leads to a car park for vehicle drivers’ convenience. Attractions: Punggol Point features a 300 sqm ship-inspired deck where visitors can admire the paranomic view of the coastline, Pulau Ubin and Straits of Johor. This waterfront jetty also has beautiful lily ponds, an event plaza and sand-filled playground. Those who love fishing can bring along your rods here to the fishing platforms. Run out of weekend staycation ideas? There is also a camping site at Punggol 17th Avenue. Visitors of all ages will definitely fit in here. Dining: 11,000 sqft of land has been aside to set up food and beverages outlets to revamp the good old seafood restaurants days. It will be a fun-filled place where diners can enjoy the spectacular views of the coastline as they savor the mouth-watering seafood dishes. Park Connector: Punggol Point is part of the 17 km Northeaster Park Connector network. Punggol Promenade links Punggol East and Punggol Point further south to the park connectors along Punggol Reservoir and Serangoon Reservoir. Nature walkers can walk/cycle along the park connectors to enjoy the lush greenery and spectacular coastline.